Exclusive Interview: The BANTAMS BANTER boys talk Wembley songs, the future of the podcast and – err – feeling like Peter Andre. The Bradford City team aren’t the only ones celebrating a campaign of non-stop success this year. Away from the football field, Tom Fletcher and Dominic Newton-Collinge, the hosts of the award-winning City podcast Bantams Banter, are raising a glass to what has been a phenomenal season of highs for them – that is, 700,000 downloads, two Wembley podcasts, a hit single, and appearances on regional and national news. For those unfamiliar with the show, the Bantams Banter podcast sees Dom and Tom chat their way through various City games, and their wild celebrations are intertwined with talk of dental hygiene, first crushes and invention ideas – among other things. 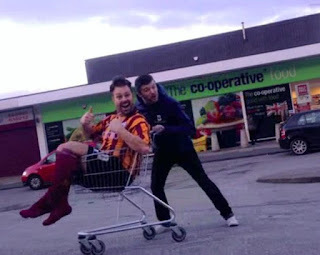 Recorded at Bradford City home and away games, the show offers a comical and refreshing insight into the unique emotions football fans encounter during those nerve-jangling 90 minutes. The quips of Tom and Dom sail effortlessly alongside some of the most iconic moments in Bantams history, making for entertaining - and often hilarious - listening. Supporters can relive the various ups and downs of the season, from the unadulterated joy after the penalty shootout victory against Arsenal to the dismay and deflation when City found themselves trailing in the Burton home leg. Features include ‘Phone A Foe’, in which the pair call pubs in the towns of City’s opponents, and commentary rap, the phenomenon responsible for several of Bradford’s goals in the cup run. There are also jingles for each player (James Hanson’s is currently Penny and Me by the band Hanson, following a controversial decision to switch from MMMBop.). And as if that isn’t enough, the duo even wrote and recorded two songs to mark City’s visits to Wembley. 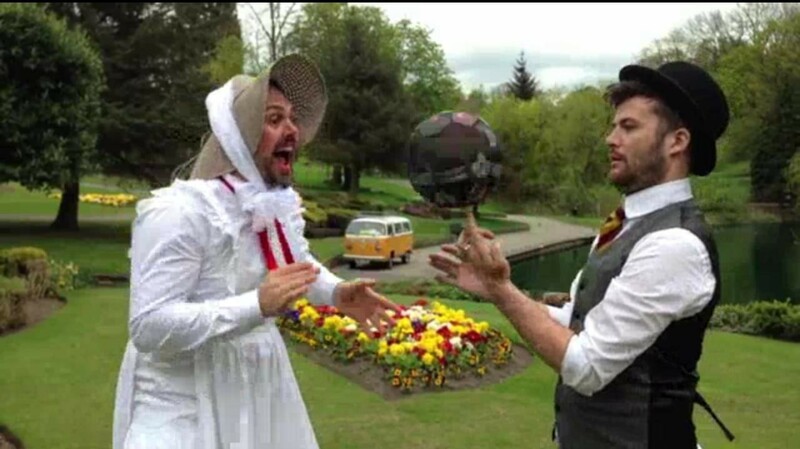 PJ and Duncan’s Let’s Get Ready To Rhumble was the first tune to receive the Bantams Banter treatment, and the accompanying video sees Tom and Dom sing, ‘Get ready, get steady for Wembley – knees are getting trembly!’ as they dance around City Park. Bradford’s success in the play-offs demanded a second single, this time in the form of a spin on the Mary Poppins’ number Jolly Holiday. “I guess this harks back to when I was at primary school,” explains Dom. “I was about six at the time. Some girls asked if I’d dance to Let’s Get Ready To Rhumble in front of the school with them. I did it, I was rubbish and I was ridiculed for it until I left that school, so I guess I wanted to try and improve on that performance and wipe away the scars it left. “Seriously, though, we unanimously agreed on both songs. The first, and arguably only decent one, was written in the majority by Tom and it just worked, along with the video. It’s fair to say that the podcast has given us its fair share of memorable moments. The Rory McArdle commentary rap, Sarah Millican impression and Wembley II celebrations make for engrossing audio, and Tom and Dom each have a personal pick of best bits. “For me, it has to be those final moments at Aston Villa,” Dom says. “The thought of those dying seconds still makes me tingle all over. The national press picked up on our emotional speech, too, so I’m quite proud of it! What about their on-field highlight? Bradford City’s success has run with the rise and rise of Bantams Banter. Tom and Dom picked up an award after being voted BBC 5Live’s Fans of The Year, filmed a Capital One Cup promotion film and appeared on everything from Look North to Sky Sports News during the cup run, and the pair admit to being bowled over by the popularity of their show. “You know how you felt when the final whistle went at Wembley? That’s exactly how it’s felt to do Bantams Banter this season,” Dom says. “It’s been unreal. Our downloads [The show has averaged 37,000 downloads per episode this season.] have been phenomenal and far beyond anything we could have wished for. “All of the national press we received, podcasting with the great Alan Davies, podcasting the rise of our beloved team… It’s honestly been amazing. We’re so proud, and to share it with fellow fans and even fans of other teams… We cannot thank our listeners and followers enough. But then, the future of Bantams Banter was thrown into doubt. The boys announced that the latest edition – #69 from the play off final – would be their last ever show, and Dom and Tom have remained tight-lipped about the fate of the podcast since. Have they decided what they’re going to do yet? “Almost!” says Dom. “Basically, I was offered a job and I was going to take it, but I just couldn’t give up the thing Tom and I have worked so hard to make into a success. It’s like our baby. Luckily, Tom was amazingly understanding about it all and told me to do whatever makes me happy, so I did. I turned down the job with the hope of carrying on with Bantams Banter. My wife and current employer have been great about it all. The thing is, we need to find more lucrative sponsorship – the podcast is relatively big now and is costing us a lot, and we need to make that money back alongside making up for the fact I’ve just turned down a better wage. And finally, how do Dom and Tom think City will fare in League One next year? “My heart says carry on this momentum and push on for promotion, but my head says mid-table finish and cement our place as good League One club,” says Tom. Visit the Bantams Banter website by clicking here. The pair lark about in the video for Let's Get Ready For Wembley. Tom and Dom's first single spawned a sequel, Jolly Holiday. Click the drop down menu and select 'Name/URL'. Then, type your name into the first box and click 'Continue', and you can type your comment in. It's easier than it sounds! How Well Do You Know Your City Squad?